The years of childhood are meant for learning lessons of life, patience, and ownership. There are many aspects of a child’s life that instill these values from a young age, however, one of the most effective activities for teaching these lessons isn’t implemented by every parent. Gardening is an activity that today’s society seems to be letting go of due to the prominence of food being produced and distributed en masse. While this phenomenon does allow society have access to a broader variety of foods in a more timely manner, there are plenty of benefits to not relying on it altogether and starting your own garden at home. One of the most significant advantages to having your own garden is the fact that the produce grown by the work of your own hands ends up being far fresher and wholesome that food bought at the store. You are in control of the process, meaning you can make the steps free of harmful chemicals and pesticides. You also have the advantage of picking the fruits or veggies straight from the vine or soil, and transferring them directly to your kitchen. This allows you to get the produce when it is the most fresh tasting, and nutrient rich. During this process with your children, you can instill the importance of eating organically, while educating them on how to get the most out of the food they eat. The process of gardening is also full of valuable lessons your child can learn. Throughout your steps of positioning the garden optimally, enriching the soil, planting the seeds, watching the growth process, and harvesting, you will have moments that breed a wide eyed curiosity. Take these chances to teach your children about the way the sun provides energy to the plants through photosynthesis, how compost can be recycled and used to enrich soil, and how to tell when produce is best to eat. Beyond the literal lessons gained from the process of gardening, there will be plenty of opportunities to instill virtues that are applicable to all aspects of life. When you get your kids excited about making life sprout from the ground, you are teaching them the gentleness and care it takes to sustain life and prevent death. You are also teaching your children to take ownership and responsibility of their actions. Due to the hard work, patience, and dedication it takes to makes sure the plants are nurtured, grown, and harvested successfully, you will teach them the importance of these values in all areas of life as well. When getting started with your garden, there are a number of factors to sort out before jumping into the project. The first step to consider is the positioning of the garden itself. If your yard is big enough, you may even be able to fit multiple gardens in for different types of produce. Some produce will thrive in areas with plenty of sun exposure, while others do best when given shade from the sun. You also want to make sure the soil where your garden is planted is suitable for starting a garden. You may even want to get samples of the dirt in your yard tested for their alkaline and acidity levels to determine how to best treat your soil. When fertilizing the ground, make sure to steer clear of harmful chemicals and pesticides as this will defeat a lot of the benefits of starting a garden in the first place. One idea to consider is to make use of the old sandbox if your children have grown out its use as a play area and re-purpose it for the site of your garden. This can significantly add to the sense of ownership for the children, with the idea that the plot of land is theirs to use even after the time of its purpose as a play area is over. Next, determine what you will plant. It’s best to start simple to increase the likelihood of success of the garden, and to help your children learn how to best grow certain plants one at a time. You may even consider starting by simply planting a flower garden to teach the principles of gardening easily. The success of being able to grow something in their garden early on will get your children excited, as well as helping keep them interested in the garden if other plants later on don’t work out as smoothly. Confectionery Sunflowers are a great flower to start with, since they grow relatively quickly and have seeds that can eventually be used as a snack later on. During this time you can get feedback from your children about what fruits and vegetables they like, as well as experimenting with recipes that introduce new types of produce to your children to potentially expand your options. Some of the top foods to produce in a garden with your children are potatoes, small carrots, cherry tomatoes, snow peas, and lettuce. Zucchini is another great option since it tends to grow very quickly, with impressive size and richness. The only drawback with Zucchini is it may take more creativity with recipes to get your children excited to eat it. When you have the perfect location for your garden arranged, and have the soil up to par for growing produce, you can finally get digging and planting. Be sure to section out your garden for each member of the family to take responsibility for. This will add depth to the sense of responsibility your children will have to take in order to keep their own produce rich and healthy. When the fruits and vegetables are harvested and cooked, they will be eating the work of their own hands. While it can be easier to buy plants from the store that have already sprouted, it is best to start with just the seeds give your children a look at the growth of their garden from start to finish. You will also want to make sure they have serious tools they can use that will be effective and as easy to use as possible. You can find child sized gardening tools at most hardware stores. Keep them engaged throughout the whole process, giving them guidance but allowing them to plant, water, maintain, and harvest their own little section of the garden. Be sure to set them up for success as much as possible, you may need to “cheat” somewhat at times. Remember that they are still kids, you want the process to be honest hard work, but not grueling. For instance if the garden ends up being plagued by slugs or weeds, you can include your children in the process of getting rid of them. If this process becomes increasingly tedious however, you may just want to go out on your own when they aren’t around to make sure everyone’s garden is free of pests, and is in tip top shape. Once your family garden is in full swing, you can slowly experiment with new plants to diversify everybody’s skills. You will find that your children will likely be eager to invite their neighbors and friends to see their gardening accomplishments. You may find that other people in your neighborhood are inspired to start gardens of their own. You may also find your kids wanting to let some of their friends into the action in your little garden as well. 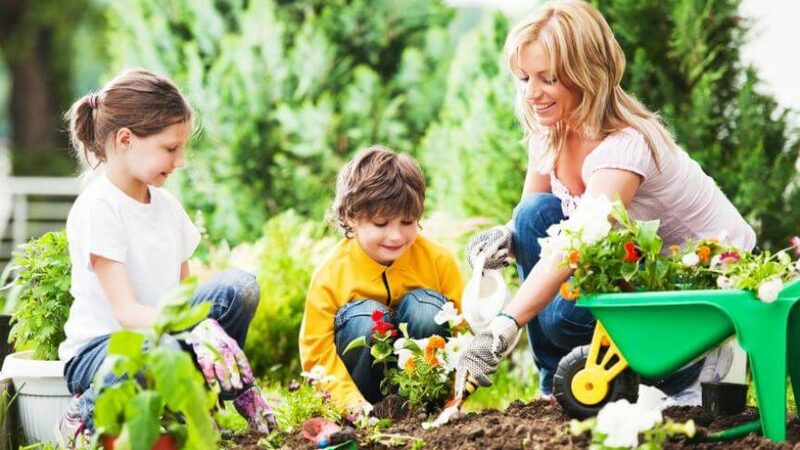 Beyond all the wonderful lessons your kids will learn by tending to their garden, you will likely find it to be place that brings the whole family together, along with building neighborly community.